It was the philosopher Aristotle who coined the phrase, “the whole is greater than the sum of its parts”. And nothing could be truer as we reflect upon the news of two legacy companies in our region that are now one: Mathew Hall Lumber and Simonson Lumber. The announcement shared by the Hall Family (see below) provides a warm and characteristically inspiring transition forward for the two companies that are now one and also for our broader community. The story of Mathew Hall’s immigration to Central Minnesota from Germany in 1882 is, in most ways, a typical migration story. Hall, along with his father and brothers, were seeking better economic opportunities in America. Like Mathew Hall, Nels Simonson’s journey was similar. As suppliers of lumber and building materials, both have been instrumental to the establishment and growth of our greater St. Cloud communities for more than a century. I can only imagine the community transformations the Hall and Simonson families witnessed from their respective, yet similar, vantage points. The GSDC is particularly grateful for Mathew Hall Lumber’s active support and engagement in the work of the GSDC over the past eight years. Through the leadership of Loran Hall, the company has been a founding and stalwart investor in the Greater St. Cloud Development Corporation. While we remain saddened by Loran’s untimely passing, and will remember Mathew Hall Lumber with deep gratitude, we look forward to welcoming Simonson Lumber Company into the GSDC investor family and continuing our partnership in making our region the best possible place to live, work, and engage (and build). Congratulations to all! Gilman, who gave him lumber in exchange for wages. Gilman encouraged him to open his own lumber yard. When he had built up a small supply of materials, Mathew rented and later purchased two lots in Downtown St. Cloud to start his business. 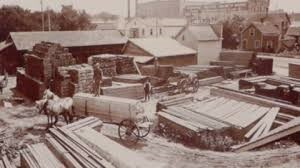 Mathew Hall Lumber is still in the same location 129 years later. “The key to Mr. Hall’s success is his perfect honesty. When he was a boy, I would have trusted him with every cent I had in the world; and the years have proved that I was justified in my faith,” explained Charles Gilman, 1915. In 1948 Mathew retired and his four sons, Herb, Al, Ervin, and Marc, took over the business. Mathew remained active in the company until his passing in 1958. Mathew’s sons were planning to sell the business until Mathew’s grandson Jim (Pauline) Hall developed a plan to purchase Mathew Hall Lumber in 1967. After running the business for more than 30 years, Jim’s children took over in 2000; the late Loran (Bonnie), John (Nancy) and Dan (Julie). On January 31, 2019 Simonson Lumber purchased Mathew Hall Lumber and will continue to operate at the current locations. Simonson Lumber was established in 1913 with their first St. Cloud location in 1927. They are a family owned business with a long history similar to Mathew Hall Lumber. hard work and dedication to our business. Central Minnesota is what made this company great. Over the last 129 years we have been a staple of St. Cloud, one of the greatest. That will always live on in each and every person that has stepped foot through our doors. Even though the name will change the memories will always be here. We would like to extend a heartfelt thank you to the community for a wonderful 129 years.